What happens if I mention a colleague who isn't part of a private client or work item? If someone without access to a note is mentioned by another colleague, they will be able to access that entire conversation. 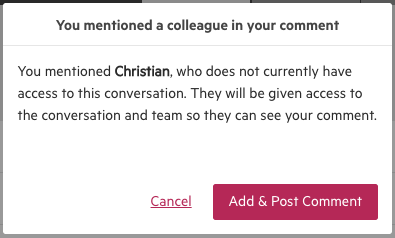 If you mention a colleague in a comment that is related to a private contact or one of their work item's, you will be required to add that colleague to the related client team or work team. A message will appear before you post the comment, just to let you know that this is happening.